The X-Mail letters page in Uncanny X-Men #131 has a letter from one David Stallman that balances effusive praise with insightful commentary and really hammers home the fact that what Chris Claremont and John Byrne were doing on the title was truly remarkable at this point in time. Of note, David Stallman observes that Magneto's wife Magda bears a strong resemblance to the Scarlet Witch, guessing that she may be her mother years before it was revealed as fact. 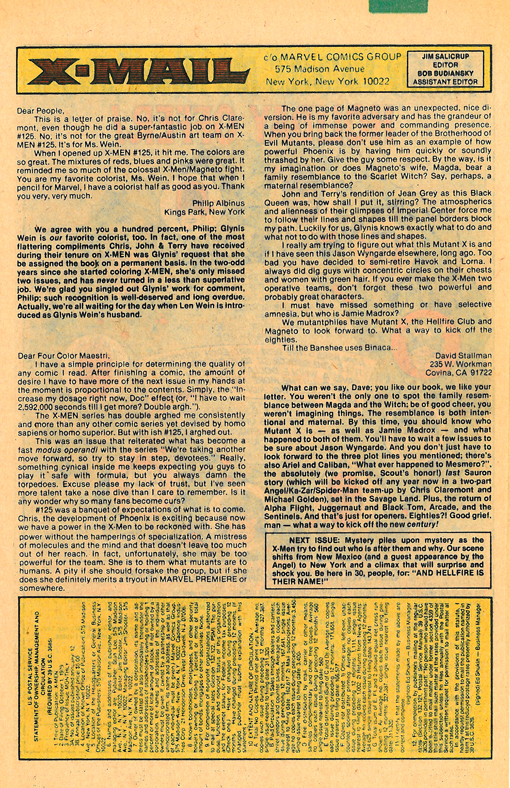 The editorial response to Stallman's note lays out tantalizing hints of what else to expect in 1980, including the return of Alpha Flight, Juggernaut, Black Tom, Arcade and the Sentinels. There is also a mention of a last Sauron story by Chris Claremont and Michael Golden set in the Savage Land that would eventually see print with the March 1982 launch of Marvel Fanfare. In the days before Marvel Age, the previews in Marvel's monthly letters columns were always welcome windows into what was to come. A statement of circulation dated October 1, 1979 appears in this month's Uncanny X-Men letters column, showing average paid circulation over the preceding 12 months of 167,641 issues. The prior statement of circulation dated September 25, 1978 appeared in Uncanny X-Men #120 and showed average paid circulation over the preceding 12 months of 113,377 issues. The October 1, 1979 figures represent an increase of average paid circulation of 54,264 issues or 47.9%. The Claremont-Byrne magic was clearly working to improve sales, so it will be interesting to see the sales figures for 1980 after the Dark Phoenix Saga.